September 13, 2015 – Adams State University continues to provide opportunities for San Luis Valley students to succeed in Science, Technology, Engineering, and Mathematics (STEM). The fall 2015 semester of STEM Saturdays begin September 19. These free interactive sessions will stimulate imagination and curiosity of students. All sessions are designed with specific grade-level, developmentally appropriate lessons in mind. Registration is required for the sessions. Sessions are scheduled from 9 a.m. until noon. Enrollment is limited. In the Creating and Controlling Lego Robots workshop, we will begin by watching a 30-minute program at ASU’s Zacheis Planetarium titled Robot Explorers. 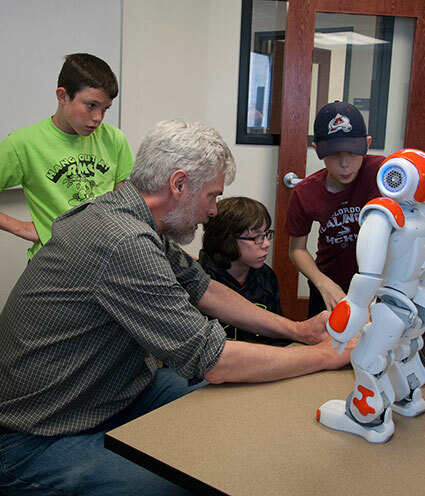 At the conclusion of the planetarium show, we will return to Porter Hall where students will learn about robots, modify and construct robots, and learn how to create efficient computer programs that will control robots. During this experience we will consider some of the challenges that NASA engineers are confronted by when they develop robotic missions for exploring the solar system. In the past couple of years, 3D printing has emerged as an exciting technology that allows the user to bring their creations to fruition in a matter of hours. Using the same plastic used in Lego design, designs can be brought from the digital world to life layer by layer. In the 3D Printing sessions, participants will learn how 3D printers work, how to operate a 3D printer and will have the opportunity to print a design chosen from a vast open-source database of cool creations. Come learn more about birds during the Bird Ecology STEM Saturday. With hands-on activities, participants will explore bird migration, natural selection in beaks, owl diets, and more. Spend the morning learning interesting information about spiders and scorpions with some fascinating live examples during the Spiders, scorpions, and bugs STEM Saturday. Participants will have an opportunity to learn how to collect and pin insects for collection. They might have the chance to eat some insects, if they dare. In the Web Design STEM Saturday, students will explore how to create interesting and customized web pages using freely available, web-based software. Students will learn some details about networking of computers and how information travels from one place to another on the Internet. Astonishing Approximations STEM Saturday – How many grains of sand will fit in the Grand Canyon? How fast does hair grow in miles per hour? What is infinity and are there different sizes of infinity? In this workshop, participants will learn about numbers from the very small to the very large by approximating answers to such interesting questions. The Exploring Fractals STEM Saturday will start with a trip to the planetarium to see the ASU-produced full-dome movie, Fractal Explorations, parents and siblings are welcome to join the class for the movie. Participants will then head to the computer lab and learn to use several free fractal generating programs. They will be introduced to the mathematics of fractals so they can understand the many different fractal formulas. They will also learn how to create their own color palettes and how to animate them. The session will finish with an introduction to creating fractal movies. The last 15 minutes of the class will be a show-and-tell for families, so students can show off their fractals. Students who bring a USB flash drive to class will be able to take their creations home with them. Registration for all sessions is required. Once registered, participants will receive the location of session and any other pertinent information. Only parent/guardian authorized registrations will be accepted. Session registrations are limited to 2 sessions per student. No cost to participants.